As I sit down to write this, there’s roughly a week left in the month of May. Quite honestly, I’m not sure exactly what to say about it. With the opening of grouper on the 1st, the month was starting out looking very promising. Those promises were about as good as setting a time to launch a rocket on the Space Coast. Mother Nature apparently decided that her precious grouper were better left untouched than end up on somebody’s dinner plate. She made her plan steadfast with heaping helping of gusty winds and rough seas! On the bright side, there were a few nice days and a few choppy, but fishable days. On an even brighter note, if you could get out there, the fishing was pretty darn good. The days I did get out there on the Relentless II, I had clients ranging from Texas to Orlando and the Central Florida area. Many were locals who like to get out and chase grouper. All in all, I’d say we had great fishing with a great bunch of people! With the opening of grouper season, many of my trips were focused on the bottom fishing. The grouper and amberjack did not disappoint. We had trips with only a grouper or two and trips with up to six. 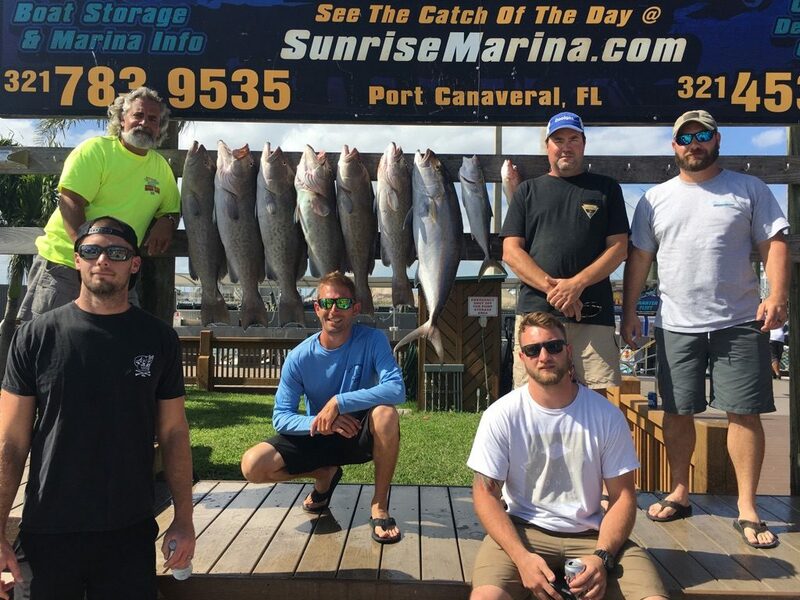 In addition to the grouper, we also caught a fair amount of amberjack and almaco jack. In addition to the bottom dwellers, we had an occasional mahi that would swim up and join the party. I wouldn’t say that the trolling was out of this world, but it was definitely worth putting some time in dragging baits. The biggest issue with the trolling was the amount of sargassum (seaweed). Normally, the seaweed is something to look for when you are trolling. But, the weed needs to be formed in a line usually running north to south along a current break. With all the wind lately, the seaweed was blown and scattered all over creation in a pattern we call a ‘jungle’. When it is scattered about in this manner, it gets snagged on your rig and fouls the bait until it can be cleared off the hook. Fish don’t eat salad! That said, it was a bit of work keeping the baits clean, but we managed to catch as many as ten mahi one day and had several days with a good handful of em. We did manage to catch a sailfish or two and heard of a couple blackfin tuna also. The slow trolling on the inshore reefs was a bit hit or miss, but generally worth a shot. There were some days when the kingfish were biting great and some days were just a slow pick. Mixed in with the kings, there were a few mahi, a blackfin tuna or two and some bonito and shark too.